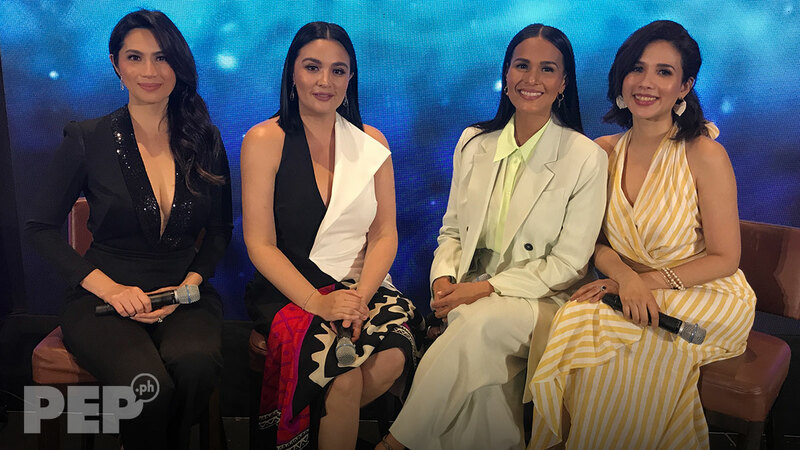 Diana Zubiri, Sunshine Dizon, Iza Calzado, and Karylle are excited for viewers to see their reunion project, Mystified. Despite being with different networks, Encantadia 2005 lead actresses Sunshine Dizon, Iza Calzado, Karylle, and Diana Zubiri are set to be seen again via the iFlix original movie, Mystified. This serves as their reunion project 13 years after the last of episode of Encantadia aired in April 2006. This is also the first project under their own production company called Sang'gre Productions, Inc. Their co-producer is Encantadia director Mark Reyes. Sang'gre is derived from how the four actresses's characters—Pirena (Sunshine), Amihan (Iza), Alena (Karylle), Danaya (Diana)—are called in Encantadia. At present, Iza is a contract star of ABS-CBN, and Sunshine has a network contract with GMA-7. Karylle is seen in ABS-CBN's It's Showtime, while Diana is a freelance actress who is part of GMA-7's Dragon Lady. Direk Mark also has a network contract with GMA-7, and is now working on the afternoon series, Inagaw na Bituin. During their March 12 press conference, PEP.ph (Philippine Entertainment Portal) asked the cast members how they avoided the network war and convinced their respective TV stations to allow them to work on this project. Iza explained, "Actually, it's really specified in my contract that I work with iFlix because I'm an iFlix partner. "So, for my recent contract which I signed in June or July last year, it's really stipulated there that I can do iFlix projects." Was there any conflict between ABS-CBN and her iFlix project? She answered with a laugh, "Well, only because it's in the contract! Hahaha! "Kasi matagal ko nang pinaalam. When I first signed on iFlix which was about four years ago, they said yes." As for Sunshine, she explained, "My contract is a little similar with Direk Mark's. We're both under network contracts with GMA. "I think, medyo may lambing and dasal nang nagpaalam and as long as it was not a series per se." Direk Mark expounded, "When you go to iFlix, you will see a lot of shows, both GMA and ABS. "So, iFlix is like Switzerland, it's neutral ground. "So, it was just a matter of asking for permission and they allowed it." Direk Mark then gave his observation when they asked permission from the rival networks. "I think, GMA was easier to say yes because I think, underneath all the contracts and all the legalities, they really wanted to see these four girls to be together again and they know they can't do it." Karylle added, "And we're grateful, we are so grateful." Iza also said, "We are grateful to our respective networks." Karylle's case is also the same with Diana's, as she doesn't have a network contract. She even quipped, "I'm very faithful, but no commitment. I'm not ready, joke lang!" PEP.ph also asked Direk Mark if they needed to ask GMA-7 to allow them to use elements and brands that are similar to Encantadia. He explained, "Beyond Mystified, it was putting up Sang'gre, Inc. that we used the term 'Sang'gre,' but you really cannot own a word. "There's already a new batch, but these are the original Sang'gres." In 2016, GMA-7 aired a remake of Encantadia with Kylie Padilla, Gabbi Garcia, Sanya Lopez, and Glaiza de Castro portraying the new Sang'gres. Because Sunshine, Iza, Karylle, and Diana are very much associated with Encantadia, Direk Mark made sure that viewers will see something new in Mystified when it premieres on March 29. "With Mystified, when you watch it, you will never see Amihan, Danaya, Pirena, or Alena in the show, we made sure of that. "Even their fight scene is very different, they don't have weapons here. "We have really nice cool weapons, but if you notice, only the bad guys use weapons, and their powers are very different. They're very concise."